This is a must-try recipe! Thanks to our Restaurant-Style Grilled Steak, you can enjoy a delicious entrée minus the trip to the restaurant. Mix all ingredients except steaks until blended. Refrigerate 20 min. Spread into 6x1-1/2-inch rectangle on sheet of parchment paper. Roll into log, starting at one long side. Wrap in parchment. Freeze 1 hour or until firm. Heat greased barbecue to medium-high heat. 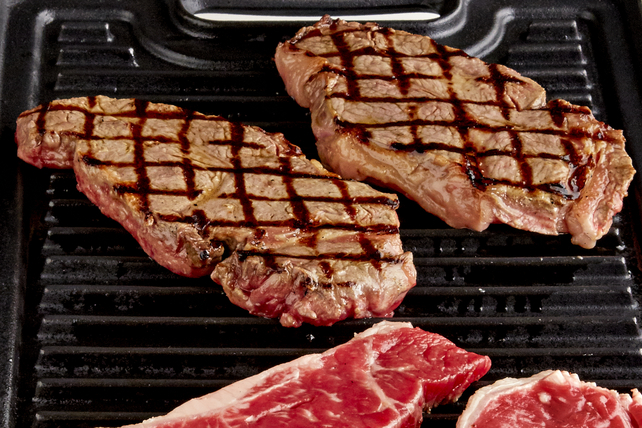 Place steaks diagonally on barbecue grate. Grill 3 min. without moving steaks. Turn steaks over with tongs. Grill 2 min. ; rotate 90 degrees, then grill 1 to 2 min. or until medium doneness (160ºF). Transfer steaks to cutting board; top each steak evenly with 1/4-inch-thick slice of butter mixture. Cover loosely with foil; let stand 5 min. Meanwhile, return remaining butter mixture to freezer until ready to use as desired. Cut steaks across the grain into thin slices to serve. Serve with 1/2 cup each cooked fresh vegetables and your favourite cooked pasta to round out the meal. Add steakhouse flavour to your favourite meat by topping each serving of hot cooked chicken, pork or beef with 1/2 Tbsp. flavoured butter. Let stand 1 min. to allow the meat to absorb the buttery flavour before serving. Or, serve slices of the savoury butter melted over your favourite hot cooked vegetables, such as hot baked potatoes or steamed fresh green beans. This flavourful compound butter can be stored in the freezer for up to 6 months before using.